Hax is the world's largest accelerator for tech startups, with a presence in San Francisco and Shenzhen, China. Small companies are given mentoring, networking, easy access to supply chains (hence Shenzhen) and a hefty cash injection in exchange for a chunk of equity. If you saw delivery robot company Dispatch creating a buzz in the headlines last year, you're already aware of one of Hax's biggest success stories. Prynt, the Polaroid-throwback printer for smartphones, and petri-dish-meat-maker Memphis Meat, are also among the investor's alumni. Every once in a while, Hax puts on a demo day for its projects to come together and show off their ideas. This week marked the 10th of those events and we went along to see what Hax is cooking up right now. Turns out, more than we thought – here are the ones that caught our eye, and why you should care. If the Feel can really do what it's setting out to – and accurately – it could mark a step change in wellness tracking. Being able to see which emotions dominate your day, and having that to share with your doctor would be highly valuable, and something we haven't seen in any other wearable to date. This unassuming black wrist tracker gets zero points for flair, but it's what inside that counts. We've seen a shift towards more general wellness from some of the biggest wearable tech companies, mostly focusing on stress, but Sentio Solutions claims to have the first band to track "emotions". According to its creators, the Feel wristband can detect moments of joy, stress, sadness, anger and even… contentment. To do that it's using a myriad of sensors to track heart rate, galvanic skin response, skin temperature and more. The app then breaks down your day into a chronological series of emotions, so you can see where you were most happy – and where you really weren't. There are activities to help too, such as breathing exercises for moments of stress, while ideas for "cheering" are currently limited to suggested funny videos, but Sentio says it's working on more substantial ideas. You'll also need to calibrate your emotions a few times in the first week, but once set it should be able to accurately detect your changing state without feedback. We actually spoke to the Sentio team about a year ago when they told us the project would hit the market in the first quarter of 2017. Now, the company tells us it's planning for January 2018. Because most smartglasses are ugly. Ok, Ok, all smartglasses are ugly. Vue's specs on the other hand are slick, but if you're not a glasses wearer then the benefits might not outweigh the cost of strapping them to your face. There's a high chance you've heard of Vue. The startup garnered a lot of attention for its incredibly svelte smartglasses on Kickstarter back in 2016, and is now on course for a consumer release. Thing is, Vue's specs are really more of a hearable. All information comes in as audio through the frame's bone conduction speakers, which can also play your music. That's how Vue has kept them so slender. I got to have a play with the latest version at Hax, and no matter how many times I try bone conduction tech, it still amazes me. A tap on the side of the frame will answer incoming calls, which you can take via the glasses' built-in mic, and they'll even track your steps. They look good and sit comfortably, but I'm still not sure the audio benefits will be enough to woo people who don't already wear glasses. Right now co-founder Aaron Rowley tells me the company is working to stop audio leaking, so you can listen to Cher's Half-Breed on full blast without anyone nearby knowing. Which is probably a concern for, er, someone. Because sleep is important! And because a lot of sleep tech at the moment is just about tracking how much you get, rather than actively helping you improve your night's rest. Everyone's trying to crack sleep, but graphs will only take you so far. Sleep hygiene is as much about external environment as it is about getting to bed on time, and Moona will regulate your sleeping temperature so that you drift off faster – and wake up feeling more refreshed. It's a device of two parts, a HomePod like tower that sits on the bedside and the pillow it connects to and adjusts the temperature of. When it's sleep time, Moona will lower the temperature of the pillow to help bring your body temp down, and raise it again in the morning to ease you to wake. The pod monitors your room's light, temperature and humidity too and will provide feedback on how you can improve your sleep environment, and the company tells me it plans to eventually integrate with other smart home tech, though that may have to wait until the second generation. It will be available this June for $399, and is live on Kickstarter now. If you don't have kids, you won't. If you life is the epitome of discipline and routine, applaud yourself smugly, this isn't for you (and definitely not your colour). But it could be a sneaky way to get children into better habits. It's already available to buy, and Joy is working on a follow-up with a touchscreen – because swiping is one habit that seems to be ingrained in every child. Kids are the worst. They make mess, they don't clean up, and they don't go to bed when they're told. Glad I never was one. The Octopus smartwatch could be every parent's dream: to teach children good habits. Dinner time? They'll get a little vibration on the wrist and a picture of a plate. Time to brush teeth? Little toothbrush pops up. Fish tank needs cleaning? They've been warned. Parents can set routine reminders on their phone and push them to the watch, which it will then store in memory until it's time to buzz. Company COO Jay Bitterlich tells me how Joy's Octopus watch is about instilling routines into children with reminders, as I nod and slowly realise this is something I would benefit from just as much. It's a little Pavlovian, sure, but if it works, who are we to argue? It also looks more than a little like an Apple Watch, but Bitterlich insists the design was chosen by kids themselves. We'll allow it. Because stress is the invisible killer, and Fitbit, Garmin, Apple and many others in that cohort are trying to fight it right now. Breathing exercises are great, but Lief goes further than what you'll find on the Apple Watch or Garmin Vivosmart 3. …because I'm stressed out. The Lief, from Lief Therapeutics, is a bio-sensing patch worn on the chest which measures your heart rate and breathing and teaches you to get them under control with rhythmic vibrations. Those vibrations make you aware of your heart rate, helping you to get on top of it. CEO Rohan Dixit explains that it can be worn all day, attaching via sticky pads, or just in moments when you're feeling particularly in need of composing yourself. "The device is always learning from you," Dixit tells me, "and when it detects you're stressed, or even before you even know you're stressed, it can turn on automatically." It's up for pre-order now and will start shipping in November. Many mothers worry about breastmilk quality, and Zio will give that transparency. With potential to do so much more, it's a shining example of a shift to at-home healthcare. Zio Health wants to get to know you on a molecular level. Stick a drop of blood, saliva, urine or breast milk onto one of its analysis pods, pop it in the mothership, and wait for the feedback. Zio's lasering in on the China market to start, where it will launch its first version of the device for breast milk, MilkSafe. This will let mothers analyse the molecular content of the breastmilk and optimise it for their baby. After that, CEO Neel Patel tells me the company is looking more globally, and at how it will work with other bodily fluids. It's not long before I drop the dreaded T-word: Theranos. But CEO Neel Patel promises that Zit won't be making the same mistakes as the disgraced blood-testing startup, and will be going through a lot of clinical trials. It will, however, collaborate to use some other companies' tracking tech, to increase its testing range. If you don't suffer from sleep problems, Dana probably isn't for you, though it could help you get a bit of shut-eye on your next flight. But for people who suffer from insomnia, this could be a viable, more effective alternative to a pill. 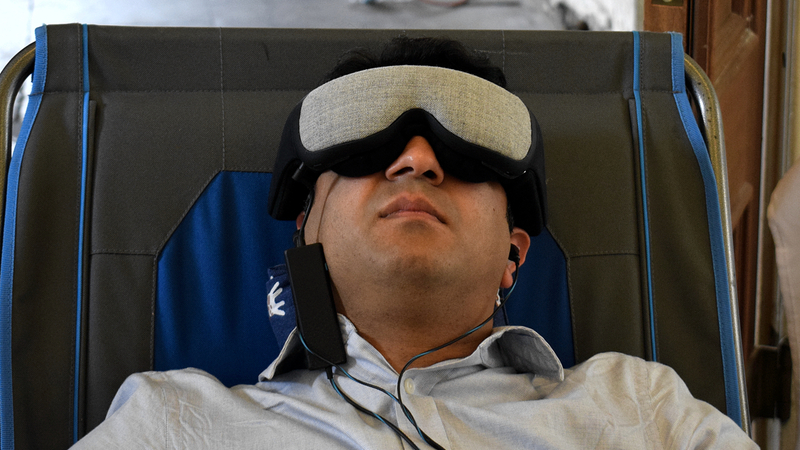 The creators of Sana claim their mask will be able to put you to sleep in ten minutes using audio-visual stimulation, which adapts to HRV feedback. And the best part? No side effects. That, CEO Richard Hanbury tells me, is what would make this the first insomnia treatment to both decrease the time to get to sleep and increase the quality of sleep. That's because most sleep-inducing drugs have side effects that mean while they can help you drift off faster, your sleep is often disturbed. Sana is set for trials with 20 sports teams – Richard tells me that for USA sports teams, sleep is more of a priority concern for players than it is in Europe – with more testing planned with UCSF and Royal London Hospital. Hanbury says the mask is currently nine months from launch. Could this really fight depression? Mental health is incredibly important to be aware of, but too often it goes ignored. SAMSA found that one in every five Americans suffer from a mental illness, but these conditions are ofer harder to diagnose (and therefore treat) than physical ones. Over 300 million people around the world suffer from depression, but, like sleep problems, it's often dealt with using medication. Flow Neuroscience has designed a device it believes can combat mental health issues using neural stimulation instead. We've tried similar devices before, like the Thync Relax Pro, but Flow's ambitions are much bigger. Daniel Månsson, CEO, tells me the company thinks it can reduce depression severity by around 30-35%. Users will have to have a diagnosis to get the device, which will need to be used for up to 25 minutes per day for 18 sessions over a six-week period. Flow is working to get fully regulated so it can have the wearable prescribed as a medical device.